Stéphane Guédé, Théophile Kouamouo and Saint Clavier Oula, the detained journalists. Image courtesy Richman. The African blogosphere exploded with anger and concern when Théophile Kouamouo was arrested with his two colleagues of the Ivorian Daily Le Nouveau Courrier. Ivorian bloggers like Manasse Dehe used blog posts and Facebook groups to update latest information and spread the news to the world. Théophile, also the project manager of the Rising Voices grantee Abidjan Blog camps, was charged for refusing to name the source of a leaked report published in Le Nouveau Courrier describing the high profile embezzlement in the cocoa-coffee sector of Côte d'Ivoire (Ivory Coast). The law has spoken. A court sentenced the journalists to a fine of 5 million CFA (roughly $10,000 USD) and released. It is a punishment which fits over the press law rather than criminal matters where we had boarded the prosecutor, provoking disgust and shocking the world. The Ivorian court has restored the image that would harm the other. It is a verdict that makes a double mistake to the colleagues. So, after they have been deprived of liberty for two weeks, their newspaper will not appear for two weeks also. This is not fair. But then, why have them jailed? 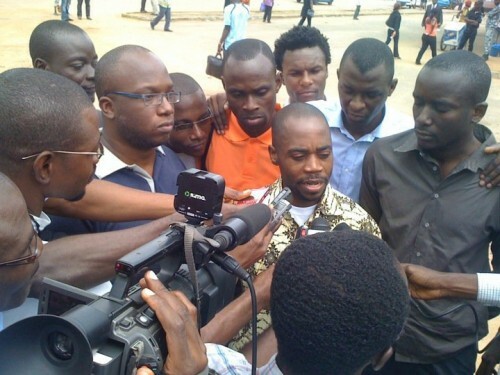 Over 1,150 activists on Change.org wrote to Ivorian President Laurent Gbagbo and the U.S. Embassy in Abidjan to register concern about this attack on the freedom of the press. Last week, the U.S. Embassy issued a statement in response that expressed concern and emphasized the importance of press freedom.